In 2003, New York attorney Nick Katsoris was inspired to write a book about a fluffy little lamb named Loukoumi that just wants to make the world a better place. The first book was written for fun after his son was born, but more than a decade later, there are 8 books in the series and Katsoris has donated over 100,000 books and donated proceeds from the books to numerous charities including St. Jude Children's Research Hospital, The Make A Wish Foundation and Chefs for Humanity. The series includes the following titles: Loukoumi, Growing up with Loukoumi, Loukoumi's Good Deeds, Loukoumi's Gift, Loukoumi's Celebrity Cookbook, Loukoumi and the Schoolyard Bully, Loukoumi In The Basket, and the latest, the environmentally themed Loukoumi Saves A Park. The Loukoumi books have received two iParenting Media Awards, two Mom's Choice Awards and The Family Choice Award. Loukoumi's Celebrity Cookbook has also received two World Cookbook Awards and features favorite childhood recipes by over 50 celebrities including Beyonce, Jennifer Aniston, Oprah Winfrey, Taylor Swift, Justin Timberlake, Nicole Kidman, Reese Witherspoon, Eli Manning, Betty White and others. Based on the themes in his books, Katsoris sponsors several national programs including the Growing Up With Loukoumi Dream Day contest, which grants kids the opportunity to spend the day in their dream careers. Past winning children have witnessed a spaceship land on Mars from NASA’s mission control, played soccer with the NY Red Bulls, cooked on TV and traded recipes with Rachael Ray, cooked with celebrity chefs Cat Cora and Michael Psilakis, spent the day with their favorite actress, met Misty Copeland at the American Ballet Theatre, spent the day in the FOX-5 weather center and at Yahoo News, met the NY Giants and the NYPD, and sang from the Rock of Ages stage on Broadway. Katsoris also sponsors Make a Difference with Loukoumi Day, based on his book Loukoumi's Good Deeds (narrated on CD by Jennifer Aniston), which rallies 100,000 kids each October to do a good deed on national Make a Difference Day. The project received a USA Weekend National Make A Difference Award in 2014 when Katsoris also founded The Loukoumi Make A Difference Foundation, a non-profit corporation formed with the consent of the NY State Department of Education, to teach children to make a difference in their lives and the lives of others (www.LoukoumiFoundation.org). The lessons in the books are now featured as part of the curriculum in over 300 schools. In April 2017, Make A Difference With Loukoumi Day received TEGNA’s National Make A Difference Day All-Star Award selected from thousands of projects nationwide. Make A Difference with Loukoumi also has partnered up with over 20 organizations including The New York Mets, The New York Archdiocese, The Diocese of Brooklyn, Philoptochos, Kiwanis, The National Bullying Prevention Center, The just keep livin’ foundation, Fordham University and many others. The Loukoumi Foundation has sponsored the Make A Difference With Loukoumi Exhibit at the Westchester Children’s Museum in Rye, NY where Good Deed of the Month programming occurs on the fourth Saturday of each month. The Foundation's first project was the Make A Difference with Loukoumi TV Special which aired in October 2014 on FOX, NBC and ABC stations across the United States and Mega-TV internationally. The live action and animated special hosted by Cat Cora starred Olympia Dukakis, Gloria Gaynor, Morgan Freeman and Constantine Maroulis. The special also featured a segment on bullying awareness, which Katsoris collaborated on with the National Bullying Prevention Center. The Loukoumi books have also been featured by many press outlets including ABC-TV’s The View, FOX & Friends, The Martha Stewart Show, CBS News, NBC News, People Magazine, Entertainment Tonight, The New York Times, Parents Magazine, Scholastic Parent & Child, Good Housekeeping, Ladies Home Journal, USA Today, USA Weekend, Disney’s Family Fun, Oprah and many others. A graduate of Fordham College of Business Administration and Fordham Law School, Katsoris began his legal career as Law Clerk to The Hon. Nicholas Tsoucalas at the United States Court of International Trade. He then served as a litigation associate at the law firm of Cahill Gordon and Reindel. In 2005 he was appointed as General Counsel of The Red Apple Group in New York, a position he still holds. Nick is also President and co-founder of the Hellenic Times Scholarship Fund, which has awarded almost 1,000 scholarships totaling over $2.5 million. He also serves as Entertainment Producer for the FOX telecast of the NY Greek Independence Day Parade. 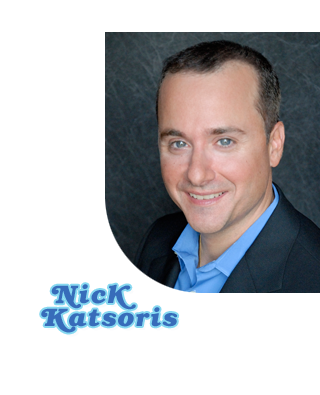 Nick currently resides in Eastchester, New York, with his wife, Voula, a real estate attorney, and their children, Dean and Julia.